I want to be a Viking! More accurately, we were asked by the National Museum to work on a Viking project. Back in 1939 a hoard of silver was found on a peninsula in Cushalogurt, off of Clew Bay, Co. Mayo. 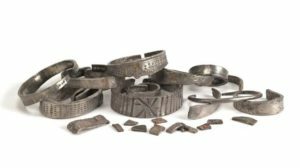 This collection now lives alongside the only other two Viking finds from Mayo in the National Museum of Ireland – Country Life in that county. In addition to the Cushalogurt finds is a Viking sword found in the River Moy and an axe head discovered in the River Robe. 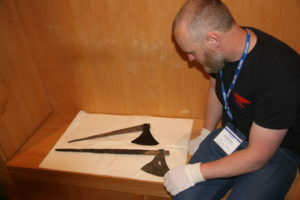 Brendan McDonnell, from the education department at the museum, approached myself and Michael who is a master blacksmith, about working on a project around the silver collection and axe head. 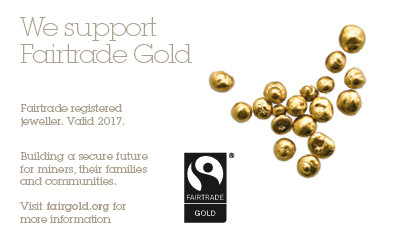 The project was to take the form of a demonstration to public and to school groups. We would demonstrate the creation of both the axe and a silver penannular bracelet. Added to this, the museum wanted replicas of both to keep in its handling collection. Naturally, we were straight onboard, which fortunately for us meant a research visit to the National Museum of Ireland in Kildare Street, Dublin. The museum has been a good family day out over the years for us and now we had the opportunity to see close up some of the items we had looked at with our kids over the years. The date, in May, had to be a Monday when the museum is closed to the public. Happily enough, this particular Monday landed on our 15th wedding anniversary. Off we went on the 7.05 from Collooney like a pair of excited kids going on a school tour, packed lunches in hand. On Kildare Street we meet Brendan before heading inside. Margaret Lannin, senior technical assistant in Antiquities, was our guide for the morning. We could hardly contain our excitement when Margaret handed us a pair of white gloves each and asked us which cases we would like her to open. A key and glass suction handles were used to open the cases while we stood by trying to look cool and calm. We spent a good while turning over in our hands these ancient artefacts. 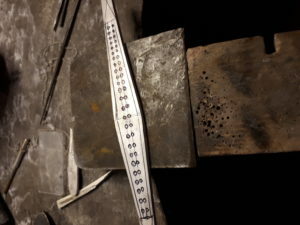 As I held a bracelet and looked at the marks left by the tools of another craft person, the thousand odd years between then and now seemed to just melt away. I don’t want to get too sentimental here, but I don’t mind telling you, it was pretty special. Being museum staff, Brendan was allowed to take a few photos for our research while Michael and I made notes of production techniques before each item was returned to its home behind glass. Our guide, showed us around other exhibits in the museum that were of interest to us – although we had to look through glass this time. 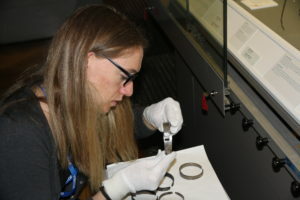 Tiffany examining a Viking silver penannular bracelet at the National Museum, Dublin. Michael examining a Viking fighting axe at the National Museum, Dublin. We both felt so incredibly lucky to have had such an amazing tour. After a good oul mooch around we headed back to Connolly station. Back on the train, we ate our sandwiches and talked about everything we had seen. Our inner history geeks were happy. We hadn’t planned a day out in Dublin for our anniversary but we couldn’t have planned a better one if we had tried. 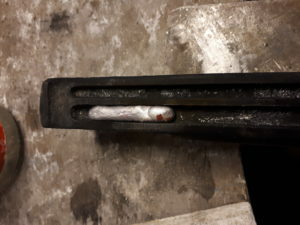 Once back in my workshop, I started smelting ingots of sterling silver to the rough size I knew I would need. Next, I designed the punches for the decorative detail on the bracelet. 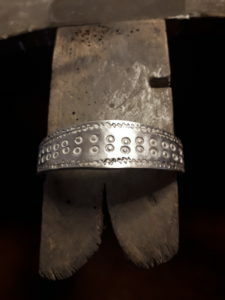 With a lot of hammering, I completed a penannular bracelet based on the one from the Cushalogurt hoard. Then I visited Michael at the forge to make my punches. These were made from engineering steel and after I had engraved the detail into the ends, Michael tempering them to the correct finish. The next step was to punch the surface design into the museum’s bracelet and polish it to a satin finish. This project was totally unlike my usual work. I was, of course, very excited to have my first piece in the National Museum’s collection. (Did you notice I said first there? Here’s hoping!) It’s always fun to do something completely different and it’s fair to say that I really enjoyed creating this very different and chunky piece of Norse bling. We spent two days at the beginning of October 2017 at the National Museum of Ireland – Country Life in Turlough Park, Co. Mayo. There, we demonstrated how these Viking treasures would have been made. By showing the techniques, the students soon become engaged with the history they were learning about. Michael, using his mobile forge (outside) heated and forged the steel to make an axe head. 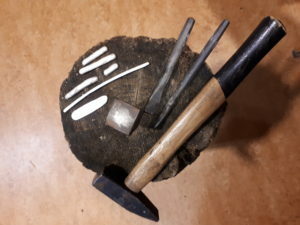 Meanwhile inside, I used a small stake anvil in an oak tree stump to forge and planish the silver ingots. I was so relieved when the questions started coming thick and fast. Far from being bored, the students wanted to find out more and a few even had a go with the hammer and punch. 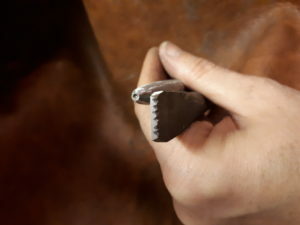 There were some hairy moments while I held the silver still on the anvil but I came away with all my fingers and they went back to their bus talking about the pillaging Vikings, the weight of their silver armbands, and demonstrating to each other how to swing a Viking fighting axe. The methodology of the education department at Turlough Park shows that learning is improved when brought to life. Fortunately, Brendan was on hand throughout to answer any Viking-themed questions from the audience that we didn’t know the answers to. So, if I didn’t know it before I found out then just how gruesome some of those Norsemen were. On reflection, I don’t know that I could be a Viking. I think I am probably, definitely, far too precious an artist to have my worked hacked up for currency; and the idea of long sea voyages doesn’t sit too well either. But I did enjoy a brief flirtation with the idea.